Tina Brown's Must-Reads — On Media, The People, And Strife The editor of The Daily Beast returns to recommend three compelling reads on the topic of the stories media tell about conflict in the world around them — and the surging force of social media, which increasingly sets the storytelling agenda. Sometimes when there's a daily drumbeat of news — war, protest, unrest — it's good to find those moments to pause, dig deeper, and find layers of the story that are easy to miss. Tina Brown, the editor of The Daily Beast, joins NPR's David Greene to help us do just that, as part of a recurring series Morning Edition calls Word of Mouth. This month, it's stories of global conflict and the media that — for good and for ill — cover those stories. Her first pick comes from Foreign Affairs magazine. It's about Turkey's Prime Minister, Reccep Tayyip Erdogan, and how he's been manipulating news coverage of political unrest in that nation. It's entitled "The Turkish Media's Darkest Hour" — and as Brown notes, the article suggests that press freedom is very much at stake there. "One of the most tangible outcomes of the protests in Turkey," Brown says, is the way they've laid bare "the full extent to which the Erdogan government there has brought the Turkish media to heel." That regime has long had "a terrible record" on media freedom and free-speech issues, Brown notes. Dozens of journalists have been jailed, according to Reporters Without Borders, and as a result "the press has been absolutely cowed. But what happened in these demonstrations was that social media took over — social media would not be cowed. "While the mainstream media was absolutely disgracing itself by not covering the riots" — at one point during the heat of things, Brown says scornfully, a Turkish broadcaster was showing nature footage of penguins — "social media ... was just alive with the truth of what was happening. And what was happening, Brown suggests, might eventually add up to "the seeds of a revolution being sown." "So, the mainstream media in the end was kind of shamed by social media — and now they, too, are having to think about how they cover all of this. ... Which is a very, very good outcome, frankly, for Turkey." That's true despite what Brown and Foreign Affairs point out is a problematic conflict between the business interests of media conglomerates and their duty to cover the news for the public. "Sheer self-interest," she says. "They want to be in business with the government, and so they don't want to offend everyone. ... They want to get contracts. 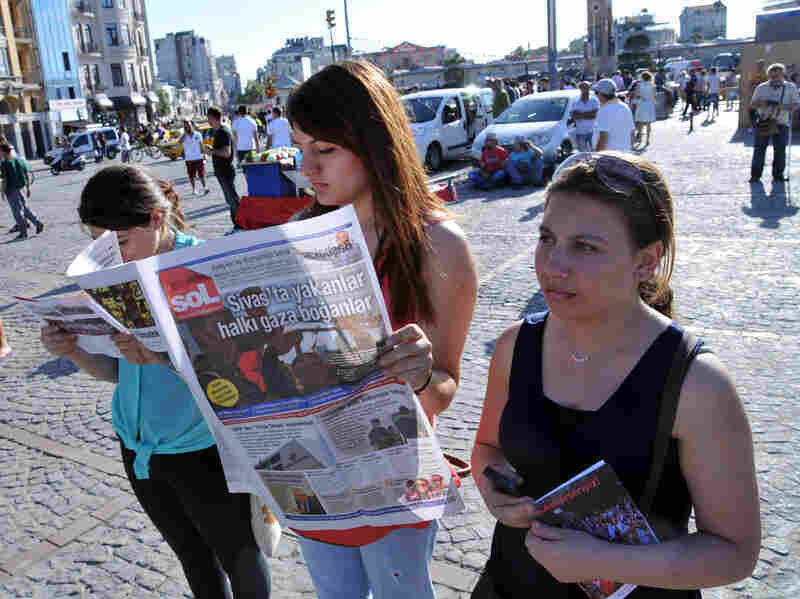 A lot of these big media people own other things, other than newspapers, and [so] the papers become a kind of mouthpiece of the government so they can flatter the Erdogen regime and thereby get the other deals that they want. "This has become a huge tipping point for the press in Turkey, and I'd like to feel that — I think all of us would like to feel — that this is a sign of the future, that actually the press will start to protect democracy, instead of become a tool of totalitarianism. ... [The Foreign Affairs article highlights] how important it is that this free press be allowed to flourish, and how social media has now made mainstream media stiffen its resolve — and grow a pair, frankly." Are Western Media Romanticizing Syria's Rebels? Brown's second pick is a New York Times Magazine article, "The Price of Loyalty in Syria," in which reporter Robert F. Worth looks at the story of that country's roiling politics from the viewpoint of the Alawites, the religious minority affiliated with embattled Syrian President Bashsar Assad. It's a perspective rarely employed by Western media. "What he really discusses is how the rebels have been overly romanticized, perhaps, by the West," Brown explains. "He interviews some very, very interesting people in the piece, who strongly feel that the Western media has become too captive to the rebels. The whole idea of the Arab Spring — the righteousness of the street rising up against a brutally repressive regime, which it is. "But the mainstream media ... have really failed to acknowledge ... how radically violent and jihadist the rebels became at a very early point," Brown says. "To demonstrate this, [Worth] interviews this very interesting woman, Aliaa, and he tells the story through the prism of her and her friend, a Sunni who's on the other side and who is anti-Assad." The young women were the best of friends, Worth's article notes. But when Syria erupted into unrest and then civil war, they were forced apart. Their friendship completely broke down. Again, social media plays a crucial role. "Aliaa is tracing her friend's increasing radicalism on Facebook," Brown explains. "The Facebook posts begin to change. She starts [quoting] Islamic slogans. She marries a man in Iraq who posts a photograph of a black al-Qaida banner. And you see these close people were actually estranged by what happens. It's a very moving piece." The article deftly evokes a certain measure of sympathy for both sides of a deeply complicated conflict, suggesting ultimately that both sides are aggressors and victims. "As the main woman he interviews says, 'We used to live side by side,'" Brown says. "But now they've been driven apart by Assad. Because recognizing that this was a way to create division, and the way to create loyalty, he has exploited [the conflict]. So it's an Arab Spring that became a poison chalice for these people who just wanted social change, and suddenly find themselves in a hideous, brutal ethnic strife." Brown's last selection is a book with a mouthful of a title: A Death in the Lucky Holiday Hotel: Murder, Money, and an Epic Power Struggle in China. It's written by Wenguang Huang, who follows an interesting case from a few years back about a British man, Neil Hayward, who was found dead in a hotel in China. "At first it was said that he had died from excess alcohol," Brown explains. "But gradually, it emerged that in fact he had been poisoned — it was alleged by the wife of the party chief Bo Xilai." It was, to put it mildly, an embarrassment to China's ruling Communist Party. "You can't suppress this kind of information anymore," Brown says. "[Even] in a country where the government operates in secrecy and the media serves as a mouthpiece, we now have Weibo, which is the Chinese Twitter, and which is tearing down the walls that block the information flow across the country." And Weibo, as the book details, was telling the Chinese people that the Neil Hayward story wasn't what the government was saying it was — "that Bo Xilai was a despot ... that there was a power struggle going on in Beijing," as Brown puts it. "It's a fascinating story that really gives you the atmosphere of a very scary modern China where you can declare somebody corrupt, you can have them thrown into jail, and they just disappear," she says. "And they very often die in custody. So this is the new stick to beat people with — to declare them corrupt. None of these so-called reforms that we're hearing about are, in any sense, what they seem."